Special members only preview on Wednesday 20th. Bacon sandwiches available from 11am everyday. Hot pies & pasties, sandwiches and baskets of chips available throughout each day; BBQ from 1.30pm Friday & Saturday. Saturday evening – the one and only Zoot Money, plus the Datchet Border Morris on Saturday afternoon to celebrate St George’s day. Samphire Bitter – 4.1% – Samphire is an easy-drinking light copper-coloured bitter brewed with three varieties of hops. The classic aroma of Kent Golding hops give way to well balanced malt characteristics and hop bitterness on the palate. This is a refreshing ale, clean and dry to taste. These limited edition ‘Imperial’ version of their award winning stout pours deeply black with a tan head. It has aromas of roasted coffee, alcohol & chocolate. The mouth feel is oily & thick tasting lightly roasted with dried fruits and licorice ending with a warming alcohol finish to commemorate the recent passing of EUSC member AJ. ‘AJ – Last of the Blue Devils Series’ Grand Marnier Imperial Stout – 8.0% – Special! ‘AJ – Last of the Blue Devils Series’ Hazelnut Imperial Stout – 8.0% – Special! ‘AJ – Last of the Blue Devils Series’ Sloe Imperial Stout – 8.0% – Special! Emperor Penguin Porter – 7.0% – Limited edition ‘emperor’ brew of our penguin porter which has been conditioned since November 2010 – Special! Alley Cat Dry hopped – 3.7% – Special edition of their copper coloured session ale packed full of flavour. Refreshing and hoppy with gorgeous aromas of tropical and lemony fruits. Dry hopped with Amarillo – Special! Royal IPA – 4.6% – A refreshing copper pale ale with a soft hoppy nose. Brewed using malted barley and full flower hops from the UK. The perfect, quaffable celebration ale. Brewed specially for the Royal Wedding – Royal Wedding Special! ‘Citra’ Single Hop – 4.6% – Copper IPA brewed each month showcasing a single hop variety. April – ‘Citra’ beautiful spring hop with pineapple, mango and citrus flavours. One to wake up the tastebuds – Monthly Special! Total Eclipse Black IPA – 5% – Black Indian Pale Ale containing dark malts which are accompanied by a citrus hop finish – New! Coffee Vanilla Stout – 5% – The vanilla and coffee in this beer strangely mellow the bitterness normally associated with a stout to produce a smooth drinking, satisfying stout –Special! The Princes Ale – 4.0% – Citra hops – Royal Wedding Special! Bishop’s Brew Stout – 4.3% – a dark, smooth full flavoured stout with a slightly nutty flavour from the distinctive roasted malts. It has a nice bitter dry finish topped off with a thick creamy head – Limited Edition Stout! Summer Gold – 4.1% – Brand new summer golden ale, hoppy and fruity with a detectable hint of vanilla and a slightly dry fruity finish – New! Georgian Dragon Ale – 4.7% – This intensely hoppy, ruby ale was first brewed in April 2010 for St.Georges Day. Harveys Porter – 4.8% – Harveys Porter is brewed from their own recipe dating from 1859.
slight hedgerow qualities – New! Havant the Foggiest – 4.5% – Banana and spice and all things nice. How a wheat beer should be – Special! Havant the Foggiest – 4.5% – Banana and spice and all things nice, with an extra kick of ginger and the calm of Elderflower – Special! George’s Gorgeous Gold – 4.0% – Special one-off golden ale (brewed at Larkins) to celebrate 3 special Georges … Papa George, George ‘Zoot’ Money and most importantly St George!! 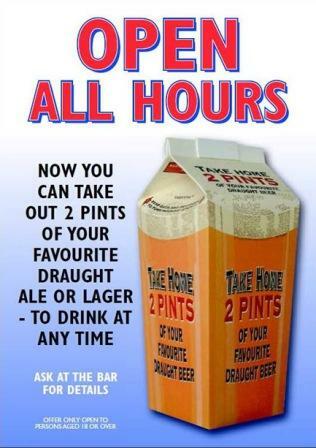 (Brewed at Larkins) – Special! Pale – 4.0% – A rich blend of hops with Maris Otter pale malts, A full aromatic and satisfying pale ale. Evin O’Riordain’s excellent Kernel beers are rarely seen in cask as he usually bottles all of his products and so we are truly honoured to have 3 specials in cask at Egham. Pale Ale (Amarillo) – 4.9% – Special! Copper to amber in colour. Aroma of tangerines and oranges. Malty body which lends to things a sense of marmalade. Followed by pithy bitterness and more fruit – citrus, oranges, touch of spice. Pale Ale (Columbus) – 5.3% – Special! Pale gold. Grapefruit all round, with a slight earthiness. Juiciness, acidity, pithiness, bitterness. A hint of wildness, dank hedgerow, the woods, and some tropical fruits, just about behaving themselves. Export Stout – (1890 London) 7.8% abv – Special! Based on a recipe from the Truman Brewery, Brick Lane, in 1890. Simple recipe – massive taste. Dark, dark black. Oily texture. Loads of rich dried fruit and alcohol warmth – rum and raisin. Then a herbal hop bitterness on top of huge lingering espresso. Hints of leather, tar, smoke, vanilla and chocolate. Roasty. The 2 festival specials commemorate the old Lagonda car factory which was located in nearby Staines. Rapier – 3.8% – Pale golden ale, slightly sweet, nice hop palette – Special! Torpedo – 5.0% – Full dark palette with a drying distinct hop finish – Special! Charon – 4.5% – Deep copper in colour with a generous dark malt flavour followed by a burst of zingy hops – Special! Maiwand Lion – 5.5% – A proper Indian Pale packed with flavour and heavily dry hopped in cask with Brewers Gold from Germany. Very aromatic – Special! Dark Side of the Moo – 7.0% – New Imperial Porter – Special! Pink – 4.0% – This Pink ale has a range of fruit flavours and aroma. This wheat beer is refreshingly balanced with a bittersweet fruity finish. A refreshingly fruity ale with bite. Perfect for summer afternoons in the sun. Or the perfect accompaniment for Royal Wedding celebrations (Bottled only) – New! Ankerwyke Ale – 5.0% – Dark malty brew with subtle hop flavour – Special! Prenuptu-ale – 4.7% – Golden and Hoppy Ale to celebrate the Royal Wedding – Royal Wedding Special! Easter Ale – 4.5% – A golden, bitter beer with a long bitter finish. Starry Night – 4.0% – House beer for the Star Inn, home of the relocated ex Bazens brewery – New! Royal Union – 4.6% – Golden Royal wedding ale – Royal Wedding Special! Porter House Blue – 6.1% – Strong, Dark and handsome! It’s made with locally grown blueberries, pitch in colour, smooth, subtle bitterness – New! Shandygaff – 3.4% – A bitter made in an old the style of an old fashion shandy, made with fresh ginger and lemon zest zing; conker in colour – New! 6D Reserve – 8% – A powerful Barley Wine, full of ripe fruit and malt flavours balanced with bitterness from traditional Goldings hops plus new world Chinook hops, leading to a long warming finish – New! 6D India Pale Ale – 5.2% – An enticingly complex hop bill of both traditional English and modern American varieties, producing a potent brew of bitter oranges and lemon fruit finishing bitter but balanced by juicy malt. Hops used Chinook, Cascade and Goldings – New! Wedding Bliss – 4.3% – Deep golden in colour, nice and hoppy – Royal Wedding Special! Windsor Knot – 4.5% – Golden ale to celebrate the Royal Wedding – Royal Wedding Special! Guardsman Cascade Finish – 4.2% – Mid-Atlantic combination of English Fuggles with North American Cascade – a twist on our classic GUARDSMAN – Special! Lime Knight – 3.8% – Our award-winning Golden Ale, dry-hopped with Amarillo and a large dash of fresh lime juice for springtime refreshment – Special! Colombian Conqueror – 5.0% – Black IPA with characteristic intense Cascade hop flavour – but balanced by coffee and vanilla – Special! Merry Moon Lunatickle 6.6% – Medium cider, Haze, gold/green colour. Good green apple with some yeast. Very good in mouth, a little sweetness, but smooth as hell. Triple D – 7.2% – Dry cider. Gloucestershire Sweet – 6.3% – Sweet cider. Sledgehammer – 8.2% – Medium dry cider. Janet’s Jungle Juice – 6.0% – Medium dry cider.